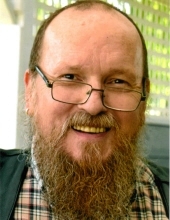 Allen Dale White, 62, a resident of the Beaverton community, died Thursday afternoon, January 31, 2019 at a friend’s home in Portland. ALLEN DALE WHITE was born June 13, 1956 in Hillsboro, Oregon the son of Robert Warden White and Patricia Ruth Calkins. He was raised and received his education in the Hillsboro community, having been a graduate of the Seventh Day Adventist Academy Class of 1974. He was united in marriage to Judy Irene Haven on September 7, 1991 in Vernonia, Oregon. They celebrated their 27th Wedding Anniversary this past September. Following their marriage they resided in the community of Vernonia, Oregon, before moving to the Beaverton community, where they have resided since. Allen worked as a dispatcher in the trucking industry as well as owning White's Wooden Wonders for many years. He was a member of the seventh Day Adventist Church in Beaverton. Among his special interests, he enjoyed reading, camping, helping others, and spending time with his family. Allen was preceded in death by his mother, Patricia White, by his brother, Robert White, and by his sister, Patricia White. Survivors include his wife, Judy White, of the family home in Beaverton, Oregon; his children and their spouses, Shawndale White, Of Centralia, Washington; Christine and Robert Storm, of Tampa, Florida; Misty and Michael Clark, of Hillsboro, Oregon; Eli White, of Beaverton, Oregon; Jesse White, of San Francisco, California; Laura and Jakeob, of Salem, Oregon; his sisters and brothers-in-law, Carlena White, of Hillsboro, Oregon; Eva Cochran, of Vernonia, Oregon; Ella Hight, of Golconda, Nevada; Bobbi McMahon, of Medford, Oregon; Missy and Carl Knapp, Jenny Koo, and Leony White. Also surviving are his 22 grandchildren, 3 great-grandchildren, and many nieces and nephews. The family suggests that remembrances may be contributions to Judy White, c/o of Tualatin Valley Funeral Alternatives, PO Box 744, Forest Grove, OR 97116, to help her support several family members in need, in Allen’s memory. To send flowers or a remembrance gift to the family of Allen Dale White, please visit our Tribute Store. "Email Address" would like to share the life celebration of Allen Dale White. Click on the "link" to go to share a favorite memory or leave a condolence message for the family.